An always popular event in the Action Day calendar that will have a new and exciting element to it this year as we welcome the National Kit & Performance Car Show (previously held at Donington) to join us for a great day filled with club displays, trade, parades & age/type specific track sessions. Wherever your allegiances lie; classic, retro or kit, soak it all up and enjoy! Submitted by Craig Lawton on April 9, 2015 - 23:58. Submitted by sanzomat on April 10, 2015 - 13:40. Very selfish of me I know but as Combe is only ten miles from my home this is fantastic news for me! I'm definitely going and as it's fathers day weekend there must be at least a degree of getting things my own way without guilt! So who's coming to Castle Combe? Submitted by sanzomat on August 5, 2015 - 21:01. 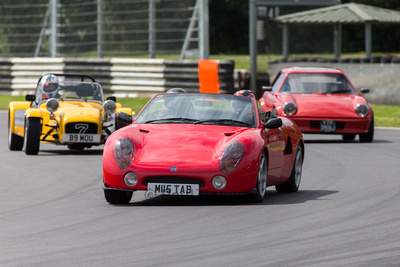 Bit belated but here is a pic of my Spyder on the track at Castle Combe on one of the track sessions. There were a few other GTMs in attendance including the very quick coupe that was briefly behind me as pictured. There was also another red Spyder there who is also a member of Bristol Kit car Club so not as rare as I thought!